Today is Neupogen day 4, and venous catheter insertion day, and Plerixofor day 1. A busy day! I had the Neupogen shot at about 9:00 this morning. At 11:30, Kathleen and drove down to Sylvester for the catheter insertion. Around 1PM, they inserted an IV line for various meds including those they used to put me in twilight. I woke up with a dull pain in my neck from the original incision point for the catheter. While I was a little delayed starting the procedure, it was no big deal because I had to hang around for the Plerixofor shot. (I’m starting to feel like a pincushion.). Anyway, the 3 brightly colored ends you see in the photo are what they use during apheresis to take blood out to collect my stem cells, and another gets used to give me the rest of my blood back after the stem cells are collected. I think the third is used in the event of some kind of other need, such as a need to give me a med while the apheresis is going on. So, so far so good. I am tolerating this whole adventure just fine. Thank you all so much for you thoughts and prayers. They are working! My goodness, you are like a pincushion! 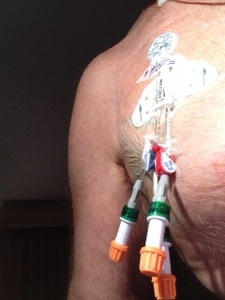 I cannot work out from the photograph what part of your anatomy this catheter is. Can you enlighten me?